A flyer for the Beach Club at Oozit's designed and sent in by Jon Savage. Oozit's was originally The Picador, opened as a gay club by Frank 'Foo Foo' Lammarr in 1971. 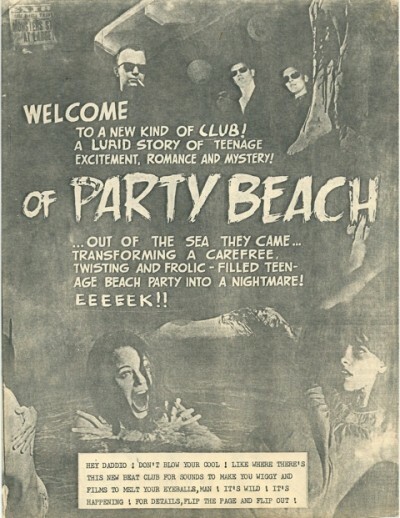 The Beach Club was a night set up by Richard Boon and other New Hormones/City Fun associates at Oozits, a seedy, collapsing gay bar with foul bogs in Shudehill that queer DJ/City Fun mainstay Liz Naylor described as “Like The Killing of Sister George." Its style (obscure film showings, the first post-Ian New Order gig) and the Situationist origins of its name would later be borrowed by Factory for the Hacienda. Indeed Richard Boon intended The Beach Club to fill the gap left when Factory’s original night at the PSV club in Hulme ended, thus there’s a nice continuity there; proof that the two camps weren’t always squabbling.